Exhausted drivers who get behind the wheel put everyone on the road, including themselves, in great danger. According to AAA, nearly 40 percent of all drivers have fallen asleep at the wheel at some point. This startling statistic means that the chances of encountering a drowsy driver are alarmingly high. If you or a loved one have been injured by a drowsy driver, call us at (815) 289-3209 to discuss your auto accident case with a Rockford personal injury lawyer. Young Drivers – The combination of inexperience with tiredness and a tendency to drive at night puts younger drives at an elevated risk for drowsy driving. Night Shift Workers – Irregular sleeping patterns can cause sleepiness for graveyard shift workers. People Working Extended Hours – Working long hours while skimming on sleep commonly leads workers to drive drowsy. Truck Drivers – Truck accidents happen when truck drivers drive long hours to make deliveries on unreasonable schedules. People with Sleep Disorders – Drivers with narcolepsy and related sleep disorders should not be driving because the risk of harm is too great. Additionally, drivers with undiagnosed sleep disorders can also pose a significant risk. Business Travelers – Jetlag and the hardships of long distance travel can leave business travelers fatigued. As part of our investigation of your auto accident case, we always inquire as to whether the at-fault driver’s action were due in part to fatigued driving. While most people are aware of the dangers of drunk driving, many don’t realize that drowsiness can significantly impair a driver’s judgment, performance, and reaction times just like alcohol and drugs. Fatigued driving can result in delayed reaction times, poor information processing, and driving miscalculations. 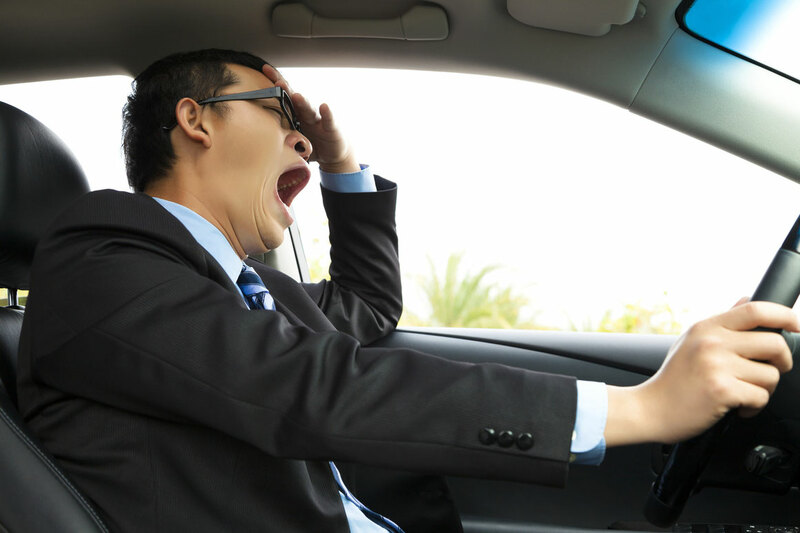 The early signs of a fatigued driver include frequent yawning, difficulty focusing, and trouble keeping their eyes open. Rear-End Accidents – Dosing off as traffic comes to a halt is a surefire way to cause a rear-end collision. Sideswipe Accidents – A driver drifting fast asleep may find themselves drifting into another lane. Head-On Car Accidents – If there is no cement divider, a fatigued driver may drift into oncoming traffic leading to a catastrophic crash. Drunk or Impaired Driving – Alcohol or drugs can lead to fatigue and even blacking out at the wheel. Stop Light Accidents – Drowsy driving can affect a motorist’s coordination and reaction time which can increase the chances of traffic light crashes. Stop Sign Accidents – Just like with traffic light collisions, slow reaction times and reduced coordination may make a tired driver miss a stop sign altogether. Highway Accidents – Out-of-state visitors may be traveling long distances and driving long hours on a tiring journey. Aggressive Driving – Sleepiness can cause moodiness and lead to aggressive behaviors on the road. According to the National Sleep Foundation, drowsy drivers reported being more stressed and impatient while driving and tended to drive faster. No matter what type of auto accident injury you’ve been injured in or how severe your injuries, you can count on the Law Office of Adrian Murati to guide you through the personal injury recovery process. Being hurt in an auto accident can leave you with medicals bills, pain and suffering, and lost wages for time missed at work while recovering. A personal injury lawyer can help you make a claim against the at-fault drivers auto insurance to recover financial compensation for your injuries. Call us at (815) 289-3209 to discuss your car accident case with a Rockford personal injury attorney.